It’s easy to feel overwhelmed by the number of home speakers on the market these days. I know I was. Upon deciding that I was going to buy new speakers, I knew I needed to narrow down potential choices. To do this, I visited the homes of several friends–friends who keep tabs on latest tech–to check out their setups. Next, I paid a visit to Best Buy’s Magnolia Room to feast my ears on the speakers Best Buy had to offer. In New Orleans, there are not too many options when it comes to test driving speakers. Best Buy sells speakers ranging from a few hundred dollars per pair to nearly $20,000 per pair. Admittedly, Best Buy’s most expensive speakers were over my budget, though they were lots of fun to listen to in the Magnolia Room. Even after spending a few hours in the Magnolia Room listening to music and movies, I still felt overwhelmed by the array of choices. Finding the right speaker is a very personal process. Everyone has slightly different tastes when it comes to sound and audio profiles. Some people prefer more bass, while other people like brighter tones, and so on. I set out looking for speakers that could project a neutral sound with a flat frequency response. Relative to speakers which amplify bright, high-pitched tones, more neutral-sounding speakers are less likely to cause listening fatigue. With no budget, based on the speakers I have heard I would have chosen the B&W 804D3 or the Sonus Faber Olympica III speakers at Best Buy. These speakers both sound incredible. The way they reproduce voices from the concert Blu-Ray playing in Best Buy was incredibly realistic. I realize there must be better speakers out there, and some are made by both B&W and Sonus Faber, but I haven’t had the privilege to sit and listen to them for any extended period of time. Back to reality… in my price range, the favorite speakers I heard at Best Buy is the B&W CM6. The CM6 towers actually sounded better than the CM7’s. That night I started looking on the internet for other brands and came across Aperion Audio, who makes the highly regarded Verus Grand speakers and now the even better Verus II Grand speakers. The Verus Grand speakers are typically compared to the likes of an SVS Ultra, the B&W CM6, and other speakers at this price point. Aperion is a company based in the Northwest U.S. and ships speakers directly to your door – an internet direct speaker company. They offer a 60-day in-home trial period for which they pay shipping both ways, so I pulled the trigger. I ordered a 5-piece set of the Verus I speakers: 2 towers, 2 bookshelves, and one center (I already own a subwoofer). The Aperion speakers arrived at my door in sturdy packaging, wrapped in velvet bags, and encased in foam. Paired with my Marantz receiver, the Aperion speakers sounded good. Then, after a week of using them, they didn’t sound good–they sounded great. These speakers don’t exude any audible sound signature. Rather, their sound is clear and neutral. They project highs that aren’t overly bright and a bass that is strong, but not overly boomy or echoey. The one thing that nagged me was the tweeter–I prefer a bit brighter high than what this speaker provided. A few weeks had gone by when I noticed that Aperion had introduced the Verus II Grand line on their website–and they were offering an introductory special. I called them up, placed my order, and waited for my new set to arrive. The Verus II Grand line has a new, improved tweeter and a better crossover for midrange sound. For their price, they sound incredible. And with the new tweeter I had high hopes. After my Verus II Grand speakers arrived, I eagerly unboxed them and set them up. From the first moment of listening, I could hear the improved tweeter sound. Aperion has their own patented tweeter design, a silk dome tweeter that that is stabilized. I kept both sets of Aperion speakers side-by-side for about a week to compare them, but after a few days it became clear that the Verus II Grand line was a step above its predecessor. They offered better midrange sound with more pronounced highs. The sound was clearer. If I had to assign a percentage improvement in overall sound (even though this is highly subjective), I would say the Aperion Verus II Grand speakers are 15% better than their predecessors, the Aperon Verus Grand speakers. Ultimately, I decided to keep the Verus II speakers and returned the Verus I system to Aperion. I use the Verus II Grand speakers on a daily basis and am extremely happy with my purchase. 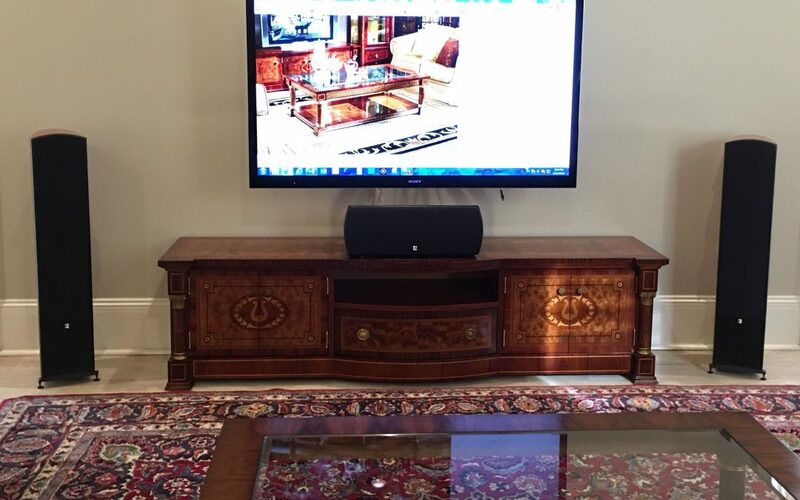 At just above 9″ tall and just under 25″ wide, the center channel is not small and will not fit into most entertainment cabinets. In all, it has four drivers and is much larger than most centers. Its cabinet is aesthetically beautiful, too, in the way it is curved on all sides and situated on rubber skis, , which allow you to angle the center wherever you prefer. The speaker uses Aperion’s patented axially-stabilized silk dome tweeter, with one 4″ woven kevlar mid and two 6″ woven kevlar drivers for bass. This center channel consistently delivers clear and crisp voices that are easy to understand without causing fatigue. And finally, the bookshelves. The bookshelves are the smallest of the speaker set, but they could easily be used as front speakers by users who lack extra space around their TV, or dislike the appearance of large tower speakers. *Mounting Note: The Pana Vise 110120B is a great mount for any speaker under 20lbs. It’s sturdy and holds the speaker with a rock-solid arm. Note: I did need to visit the hardware store in order to get the proper machine screws to mount the speakers on my ceiling. Additionally, I took the liberty of adding another rubber gasket to the screw, along with some felt padding to the mounting bracket to protect the speakers’ finish. As you can see the bookshelf Verus II Grand speakers have threaded inserts that come covered with rubber plugs – 1 on the bottom and 2 on the rear for easy mounting. All the Verus II Grand speakers come with four binding posts that are compatible with banana plugs or raw wire, with 12 gauge jumpers. You have the option to Bi-Amp them. The towers weigh 65 lbs. each, the center weighs in at 39lb, and the bookshelves are 14lbs each. The speaker cabinets are internally braced and smoothly curved. Made with furniture grade Cherry veneer that has an excellent finish; they look like they cost more than they do. Aperion also offers the speakers in a glossy black and as of this Winter, they are offering what they call “Stealth Black”. These speakers are well designed and well built. My only qualms involve the floor pads, which sit under the speaker “spikes.” The pads are made cheaply and fall apart when moving the speakers, even a little bit for cleaning or adjusting. I ended up buying solid brass floor pucks off eBay to place under the speaker “spikes” which ended up being much more durable. It would be minimal additional cost for Aperion to include some higher quality floor pads, and I hope they do so in the future. But after spending so much energy on a set of speakers, and having only 1 minor complaint – these speakers are definitely a good buy. Aperion’s customer service gets high marks from me. They answer the phone during business hours. It’s a small operation, they are knowledgeable about their product, and customer reps happily offer practical advice. Also, the speakers come with a 10-year warranty (provided the original shipping boxes are kept; the customer pays for return shipping). Aperion products are worth considering, especially if–like me–you are looking for speakers in a mid-range price point and prefer a neutral sound profile. With Aperion speakers I can binge watch Netflix to my heart’s content without subjecting my ears to listening fatigue. With the company’s generous home trial period and 100% money back guarantee , why not take ‘em for a test drive?